As a Multilingual Wikipedia user: When I have proven myself as an editor of good standing, I want to be shown articles with a title description that can be translated into other languages I speak, so that I can grow my contributions to Wikipedia. For this ticket, do "first time message for translating title descriptions" "Translate title descriptions feed" "review title description" "overflow menu"
cmadeo mentioned this in T205125: [EPIC] Encourage more editing in the Android app via an "App Editor Tasks" list (aka Edit Action Feed) . Charlotte set the point value for this task to 5. Charlotte triaged this task as Normal priority. Charlotte moved this task from Backlog to Ready for dev on the Wikipedia-Android-App-Backlog (Android-app-release-v2.7.27x-L-Lamington) board. cooltey moved this task from Ready for dev to Doing on the Wikipedia-Android-App-Backlog (Android-app-release-v2.7.27x-L-Lamington) board. cooltey added a subscriber: cooltey. Sharvaniharan moved this task from Ready for dev to Doing on the Wikipedia-Android-App-Backlog (Android-app-release-v2.7.27x-L-Lamington) board. @Sharvaniharan This still seems to be missing the functionality seen in the first three "mock" images. Will you take care of them? After one title description edit in any language, the “Add title descriptions” task is unlocked and the “Translate title descriptions” task is shown in the list but is locked. 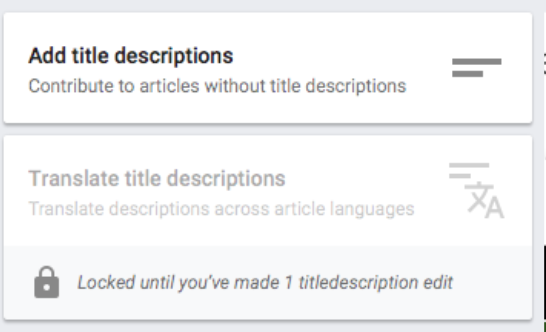 One more title description edit (the 2nd) will then trigger a dialog which says that “Translating title descriptions have been unlocked”. This dialog is only needed for the prototype and user test, otherwise there is no visible incentive for users that they’ve unlocked something. The previously locked task (“Translate title descriptions”) would then be unlocked as well. You can now help to improve Wikipedia by translating the captions that appear on images in articles. You can configure your languages and set a translation direction at any time. 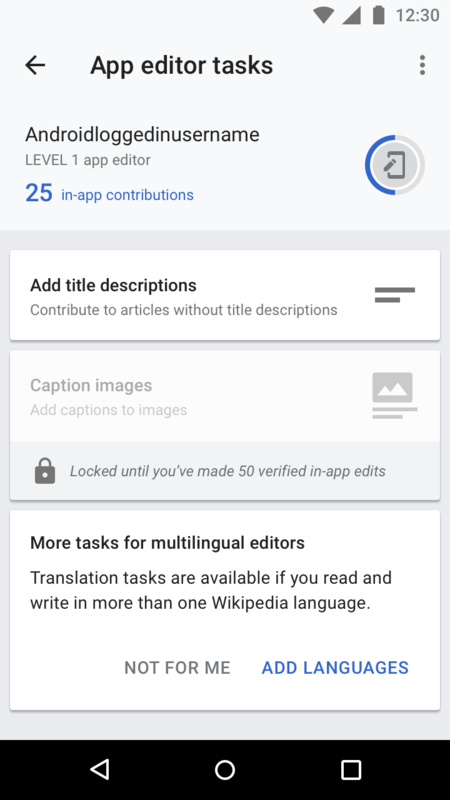 After 50* valid title description edits in any language, the “Add title descriptions” task is unlocked and the “Translate title descriptions” task is shown in the list but is locked. 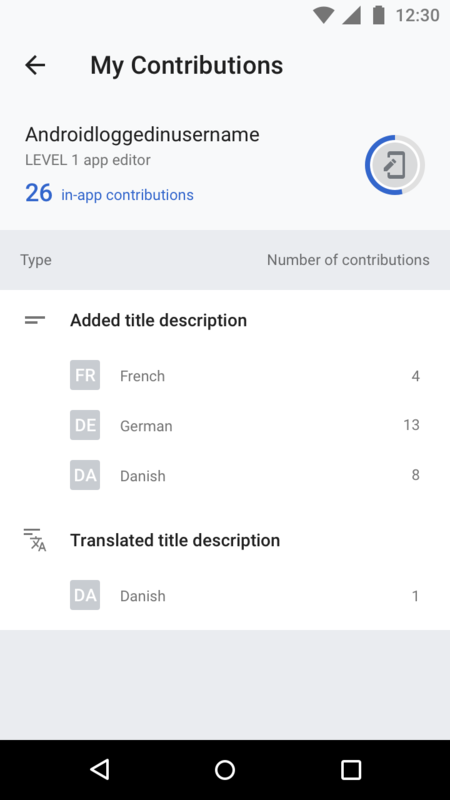 When users are tapping on “Translate title descriptions“ they will be confronted with the language test/assessment, which is defined in T207684 (work in progress). 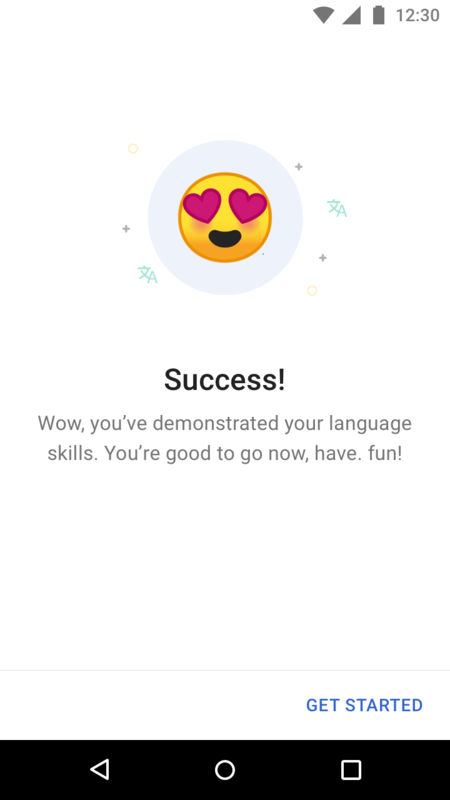 The previously locked task (“Translate title descriptions”) will then be unlocked, as soon as the language test has been completed successfully. The proposed 50 non-reverted edits for adding title descriptions was in the [[ https://docs.google.com/presentation/d/1b7-FeIdFnDrKG1ko8SbOi_EVhYzx-LON3RdyCDlrBbA/edit#slide=id.g338789738e_0_308 | Edit Action Queue deck ]]that I put together. However I would say that was just a number I pulled from the air and should be variable. Let me know if you have any questions or if something’s unclear. Hi! Just wanted to drop in here to document what we discussed in stand up this morning. @schoenbaechler, if you wouldn't mind double checking this that would be awesome! In the meeting we discussed having users add a new language from the edit action queue main page (see the final feature mock for users with only one app language). 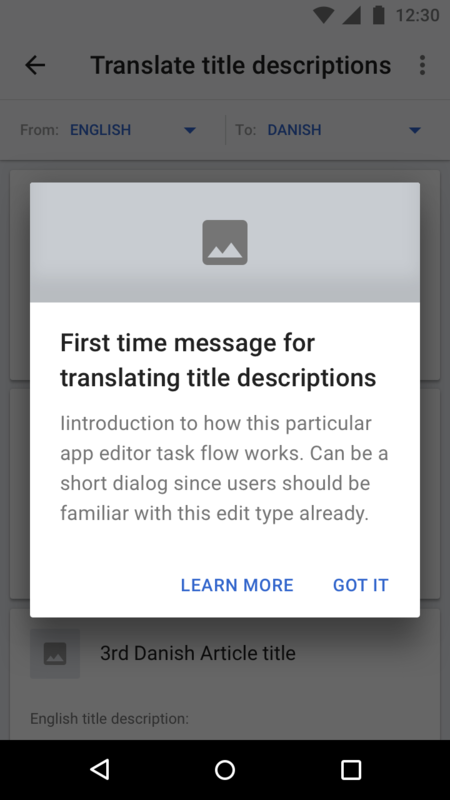 but perhaps it would be easier to have them add a second language in on boarding so they can automatically get the notification to translate after their second edit? Users will need to tap on the locked task types to trigger the language CAPTCHA. Upon successfully completing the language CAPTCHA they will be able to access any translation tasks for tasks that have already been unlocked (eg. 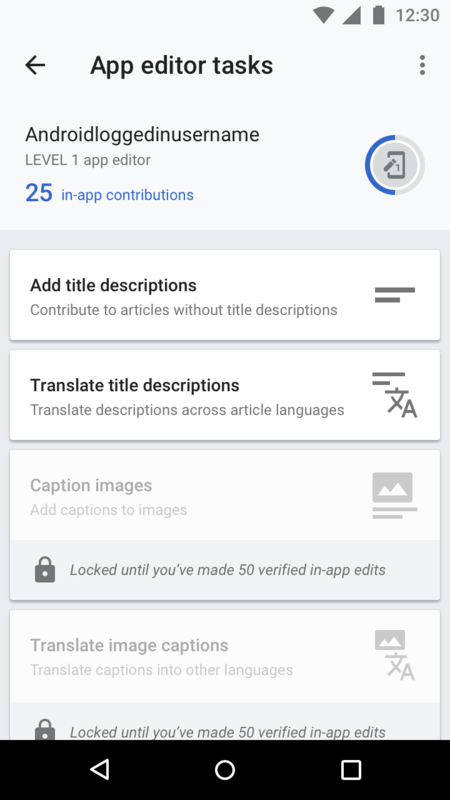 under 50 edits they will only have access to title description and title description translation, when they unlock image captions they will also unlock image caption translation). (...) but perhaps it would be easier to have them add a second language in on boarding so they can automatically get the notification to translate after their second edit? You can now help to improve Wikipedia by adding descriptions that appear below titles in articles. 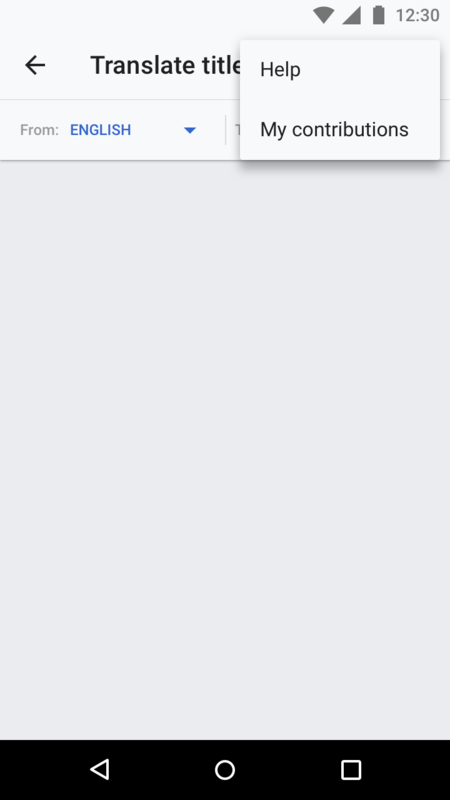 You can configure your languages at any time. You can now help to improve Wikipedia by adding the captions that appear on images in articles. You can configure your languages at any time. Also added it in the Missing copy for app editor tasks document. "1. 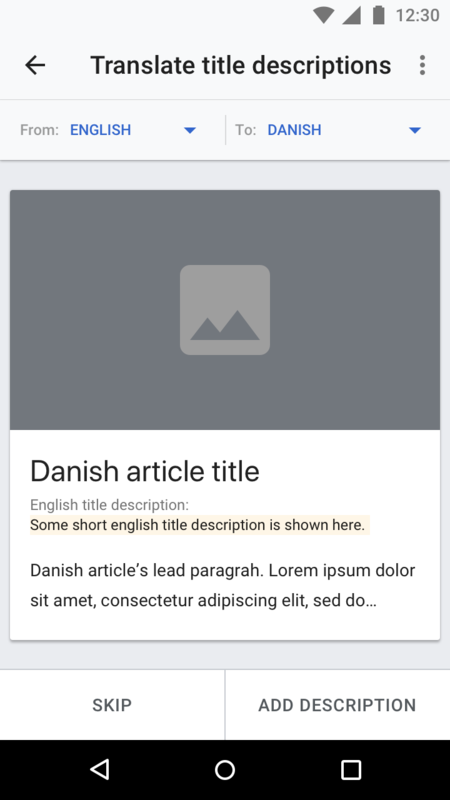 What happens if the user unlocks the edit feed by making the very first edit, sees unlock dialog, hits ‘Maybe later’ and goes on to read few more articles and along the way makes description edits? Let us say user made 3 edits. A. Should both title and translate description options be unlocked and available now? B. If user hits on ‘Add Title Descriptions’ , both first time title edit dialog and translate unlock dialog are now waiting to be shown. Should they both be shown one after the other? Should the translate unlock not appear? Should translate unlocked dialog have appeared anywhere wherever the 2nd edit was made? 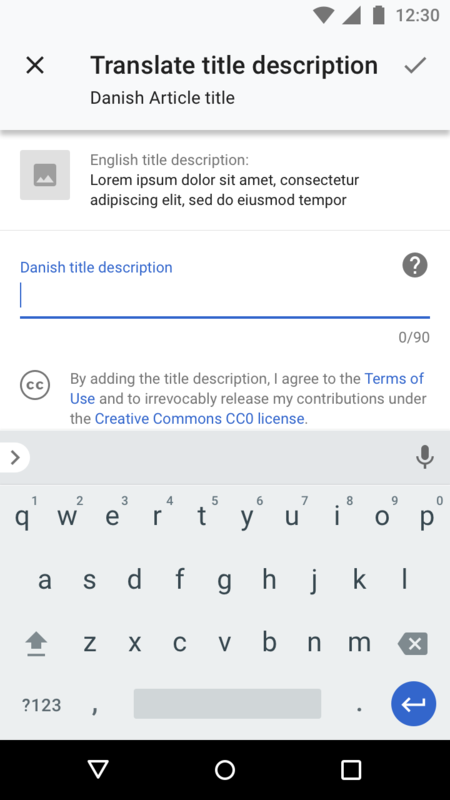 C. What happens if the user enters the edit feed, chooses not to hit 'Add Title Descriptions’ , but hits ‘Translate Title Descriptions’ which will now be unlocked. When they next visit 'Add Title Descriptions’ obviously the translate unlock dialog doesn't make sense, so should we include logic to track that and not show translation unlock dialog?" these questions need to be answered and rectified before production release. 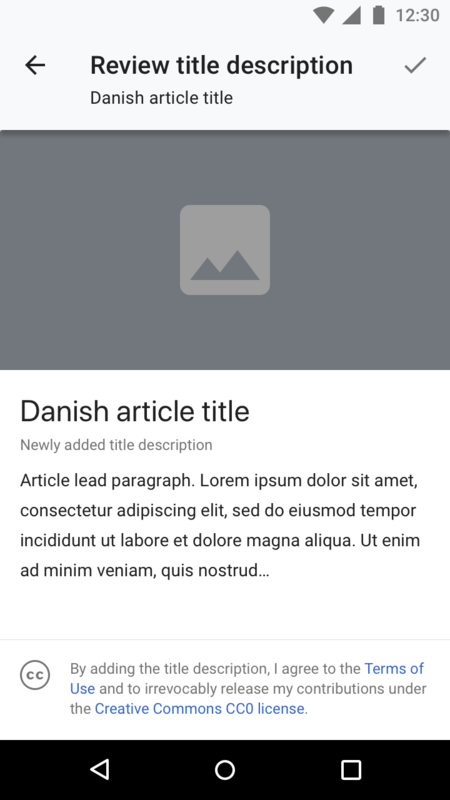 Dbrant moved this task from Ready for signoff to Design signoff on the Wikipedia-Android-App-Backlog (Android-app-release-v2.7.27x-L-Lamington) board. Moving this back to the “Needs Design/Design doing“ column since there will be modifications to the flow/screens based on feedback from usability testing. This is a legacy task for “Editor tasks“ prototype. All changes will be addressed in T215630. Moving this to “Ready for signoff“.